Here's another one of our favorite chicken dinners that is quick and easy to make. 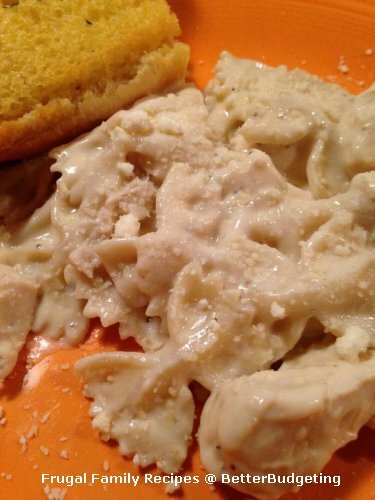 It's not as fancy as homemade alfredo but it gets an A+ from mom and dad on a busy school night. Extra bonus points: The kids love it! In large pot or saucepan, stir together cooked chicken, heated alfredo sauce, cooked and drained pasta. Add salt and pepper as desired and top with grated parmesan cheese. Serve with salad and garlic bread. Option: Top with fresh or dried herbs such as basil or parsley.